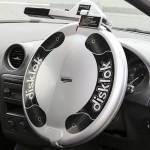 The Disklok is the strongest and most effective full cover steering wheel security lock in the world. Disklok is unique: it spins on attack and prevents the steering wheel from turning. Unlike single bar locks, the Disklok fully covers the steering wheel, and cannot be removed by cutting the steering wheel rim. It's available in several sizes and colours to suit any vehicle.